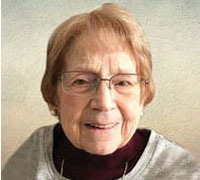 Cathy Lafrance (nee Leroux) of Calgary, AB, passed away into the arms of our Lord on March 17, 2019 at the age of 86 years. Cathy was a kind, loving woman who caught the eye of Marcel Lafrance and were united in holy matrimony for thirty three years from 1951-1984. She was a very devout catholic and was an active volunteer for many organizations including president of the CWL Catholic Women’s League, board member of St Theresea Auxiliary Hospital and was a volunteer for the Civil Defence. Throughout her lifetime she worked as a AGT Telus phone operator, one of 7 sisters who were employed by AGT but most of all she was a loving homemaker. In her spare time she loved to spend time curling, bowling, aquasize, dry flower arranging, oil painting, sewing, crocheting. Cathy was very witty with a great sense of humour, she was a good sport, competitive in games, a generous host and loved social gatherings and having fun. Cathy often assisted in many different ways when others faced tough times. Cathy is survived by her children, Jeannette (Dan) McLachlan, Marcy Hannah, Martin (Kim) Lafrance, Jaret (Alixe Ryane) Leah, Phil Lafrance, Allan (Pam) Lafrance; grandchildren Robin Scobie, Dana Scobie, Jamie Hannah, Karla (Mat) Thomas, Amanda and Marc Wenger, Camille Lafrance, Braye Ryane, Casey Ryane, Layne Lafrance, Marc Lafrance; great-grandchildren, Jordan Scobie, Micheala Scobie, Emma Scobie, Dexter Scobie, Mae Thomas, Madeleine Wenger, Sarah Hannah; her siblings Therese (Ian) Rudiger, Trudy (Bill) Perkins, Liilian (Bill) Perkins; her brother-in-law and sister-in-laws Roger Goulet, Marge Leroux, Laurette Leroux Denis Saito, Esther Leroux; as well as numerous nieces and nephews. Cathy was predeceased by her loving husband Marcel Lafrance. Funeral Mass will be celebrated at Holy Spirit Catholic Church (10827 – 24th Street S.W., Calgary, AB) on Saturday, March 23, 2019 at 11:00 a.m. Reception to follow in the Parish Hall. Condolences may be forwarded through www.mcinnisandholloway.com. In lieu of flowers, donations in memory of Cathy will be greatfully accepted towards to Medicine Hat and District Food Bank, https://www.canadahelps.org/en/charities/medicine-hat-and-district-food-bank-1992-association/?gclid=EAIaIQobChMI3umJi92O4QIVNB-tBh1SYATcEAAYASAAEgIx0PD_BwE&gclsrc=aw.ds. In living memory of Cathy LaFrance, a tree will be planted at Fish Creek Provincial Park by McINNIS & HOLLOWAY FUNERAL HOMES, Deerfoot South, 12281 – 40th STREET S.E., Calgary, AB T2Z 4E6, Telephone: 403-203-0525. We are very sorry to hear about the loss of your mother. You and your family will be in our thoughts and prayers during this difficult time.